An adjustment or manipulation is a high-velocity low-amplitude impulse done either by hand or a small instrument performed by a Chiropractor. 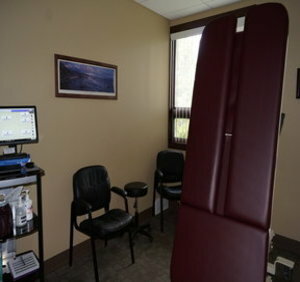 Doctors of Chiropractic are trained in several techniques to help locate, analyze and gently correct specific misalignments (subluxations). The objective of a chiropractic adjustment is to realign vertebrae that have moved out of place. When vertebrae are not moving properly, it has an overall systemic effect ranging from muscular involvement to the central nervous system interruption. Without proper alignment, brain to body communication can be delayed or interrupted leading to symptoms of disease. Often times, patients ask about whether or not the doctor will make their spine pop or crack. Frequently when done by an instrument you will not hear anything from the adjustment. However, if the adjustment is done manually (by hand) you may hear a noise that sounds like you're cracking your knuckles. This noise is called a cavitation. Joint cavitation is nitrogen gas that is being released from the joint space. This release can cause a release of endorphins which is why some people frequently crack their own knuckles and necks. It is an instant feel good stimulator. Because humans are weight bearing on their spine while walking on two feet, gas builds in the joint space, and occasionally when receiving an adjustment this gas will be released.